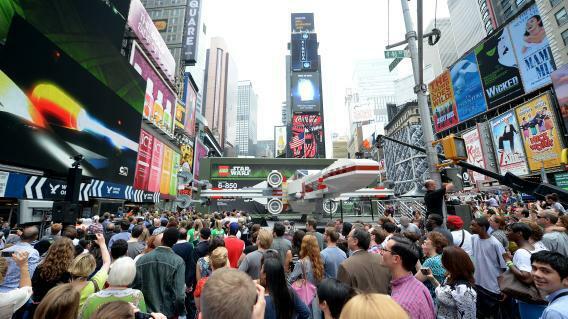 World's largest LEGO model: 23-ton Star Wars x-wing starfighter is in Times Square. The world’s largest Lego model is on display at Times Square in New York. 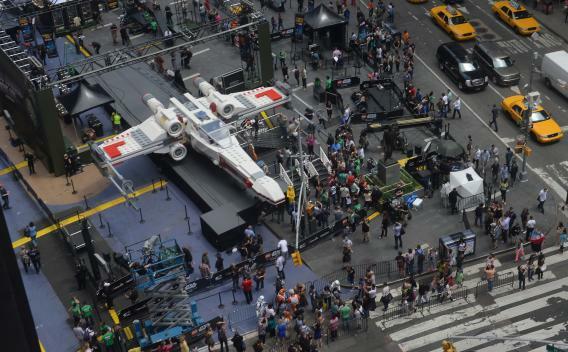 The world’s largest Lego model, a 45,000-pound Star Wars X-Wing starfighter, is just sort of sitting in New York’s Times Square right now. It was assembled by a team of 32 people over the course of 17,000 man-hours in Kladno, Czech Republic, on what one assumes was the world’s largest living-room floor. The X-Wing comprises 5.3 million Lego bricks, some 2 million more than the previous title-holder, a robot at Minnesota’s Mall of America. At 43 feet from front to back, it’s actually two feet longer than than the fictional X-Wing that Luke Skywalker flew into battle in the original Star Wars movie. The model will remain in Times Square through Saturday before being packed up and shipped to Legoland in Carlsbad, California. The White House last year staunchly refused to build a Death Star despite a popular online petition to do so, citing budget constraints and an estimated cost of roughly $850 gajillion. But perhaps someone could at least build a life-size Lego Death Star so the Lego X-Wing will have something to blow up. Everyone knows the best part of playing Legos is at the end when you crash them into each other and send the pieces flying all over the room. 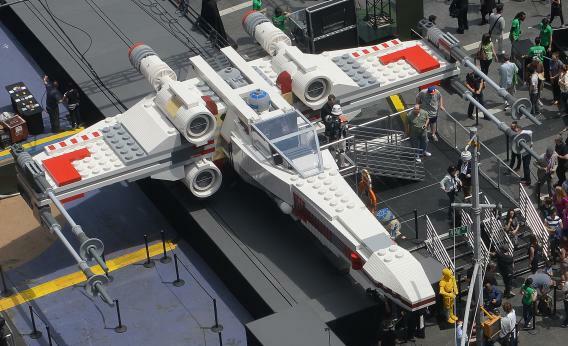 The Lego X-Wing is 11 feet tall, 43 feet long, and has a 44-foot wingspan. The model was transported to New York from Europe in 32 sections via container ship.